Defense Minister Ehud Barak: Nuclear Iran would lead to a nuclear arms race throughout the Middle East. 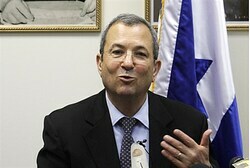 Defense Minister Ehud Barak said on Wednesday that Israel will soon need to reach decisions regarding Iran. Speaking during a graduation ceremony at the National Security College, Barak said, “The State of Israel is facing some of the most complex challenges which its security and political leadership has ever had to face. “We may be required to make difficult decisions concerning the national security of Israel and ensuring its future,” he said. “The whole region around us has been turbulent and noisy for almost two years, instability is increasing and security challenges grew each day. The events of the Arab Spring which gradually became an Islamic Summer teach us that in the ultimate test we can rely only on ourselves. Regarding Syria, the defense minister said, “We are closely following the developments in Syria. We said and we mean it that the State of Israel cannot accept the transfer of advanced weapons systems from Syria to Hizbullah. A massacre and murder of citizens by government forces is going on Syria as the entire world watches.